If you have a small home and your child’s bedroom is also used as a guest room then you might want to consider some of these helpful, modern design tips to make every guest and your child comfortable. Consider getting a furniture set that features a neutral look, not too “kid like”, but not too over the top sophisticated either. Choose a neutral colored bedding set and wall color to create a room that adults and kids will feel comfortable in. Then let your child get some funky, fun accessories that express his/her personality and spread those accent pieces around the room. Accessory suggestions include: decorative, colorful throw pillows, throw blankets, lamps, plus colorful fabric that can go over a valance to add splashes of color above the windows. Your child might also want to get some stuffed animals or photos of friends and put them on shelves and dresser tops. Make sure that whatever accessories you get can be easily stored away when guests come to town. This way, when grandma and grandpa visit, your child can put the funky things in the closet and the grandparents have a comfortable place to sleep for the week without feeling like they’re intruders in their grandchild’s bedroom. Below are four beautiful kids furniture sets that any guest would like and any child can accessorize to create the perfect kid’s room and guest room all in one. 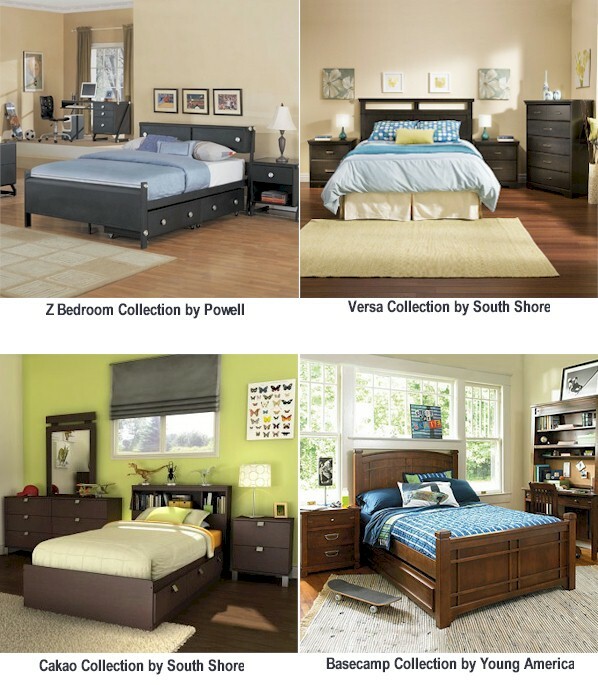 You’ll find images of the following four kids bedroom collections below: Z Bedroom Collection by Powell, Versa Collection and Cakao Collection by South Shore and the Basecamp Collection by Young America. P’kolino is a company that truly gets what kids are all about! They realize that children learn through fun and play, so all their furniture is designed to create a very playful space for a child. They use bright, cheerful colors like vibrant orange, hot pink, fun purple, bright blue and a grass green. Their furnishings are also kid size, so children have a totally cozy place to sit and play. You can mix and match these fun furnishings to create a one-of-a-kind, modern space for your child. If you add furniture from P’kolino to your kid’s bedroom or playroom your child will thank you!